Despite my best intentions, I have once again gotten myself sucked in to American Idol. I had promised society that I wouldn’t watch this show anymore, and I have to beg everyone’s forgiveness. It’s not that I have anything really against this competition, but when I’ve watched Idol in the past the winners have been very disappointing; the only seasons that I attended to faithfully produced such greats as Ruben Studdard, Fantasia Barrino, and Taylor Hicks. For the sake of decent music, I chose to forever abstain. So before this season produces another pseudo-star, I wanted to take the opportunity to point out my scapegoat, the person we can all blame if we find ourselves with yet another American Flop. It’s Ryan’s fault. He wanted me to watch the early episodes with him (because he likes to laugh at the stinky auditionees; such cruelty…), then he wanted to see how Hollywood went, then he wanted to keep watching because he has a favorite contestant, and now I’m STUCK! I’ve gotten really in to the competition (I even know all of the contestant’s names! ), and now I have to see this season through. 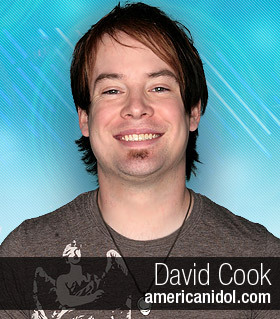 Since it’s still pretty early, I wanted to let everyone know that I do have a favorite: David Cook, the rocker from Missouri. I have no idea how big his fan base is, and I really don’t anticipate him winning the whole thing, but I love his voice. I just hope he can make it long enough to get some recognition so he can sing for a band or something (a’ la Daughtry).